The POSCHE Manila Studio is located directly off of Rockwell Drive in Makati/Rockwell Area. 5 Minutes walking from Rockwell Power Plant Mall. 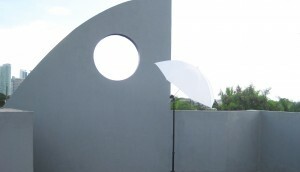 SHOOTING AREA : The photo shooting area is 10ft x 25ft x 15ft and is perfect for shooting with a natural diamond shaped area. Ceiling is 10ft. RECEPTION : The Studio office area is 12ft x 18ft. 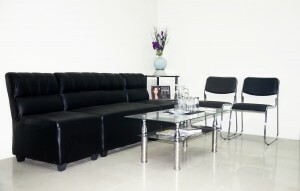 with inside comfortable black leather sofa seating and a small waiting area outside the doorway. Great for project meetings and castings. MAKE UP AREA : The Make Up tables and lighted mirrors are at each end of the studio and office. Each area is spacious with 7’x 7’ standing room, andeach comes with moveable tower standing light if needed. There are separate Female and Male dressing room/CRs. ROOF TOP: Floor Tiled roof top shooting area is 1900sf. And, there is a separate fully useable CR on the Rooftop. Great for photo shoots or as venue (runway shows, fashion presentations, small weddings, parties/celebrations). 9ft x 9ft Backdrops. Seamless white paper, white or black cloth. Flooring is extended 9ft in white seamless vinyl, or carpeted Navy Blue, Grey, or Burgundy. 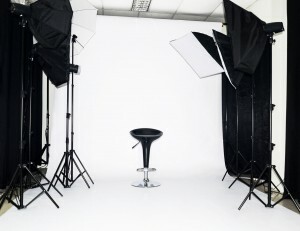 Lighting is 4 Photography Strobe Lights ,(2) 165B – 75 Wattand (2) 135B- 60Watt. Also, Extendable Boom Hair with (4) 15 Watt Flash Bulbs. 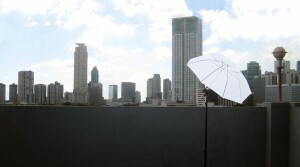 White photography umbrella is also available.